Jamestown Philomenian Library is starting a book club for kids in elementary school who are interested in reading great works and talking about them with others. 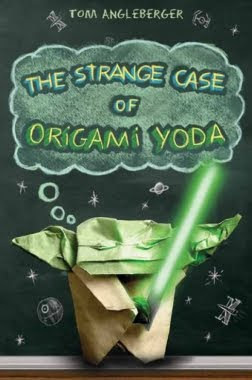 Join us on Thursday, December 9th from 3:00 p.m. to 4:00 p.m. to discuss Tom Angleberger's recent book, The Strange Case of Origami Yoda. This discussion and craft session is geared toward kids grades 3-5. Snacks will be provided, so come with a hungry mind and stomach! This is an anticipated monthly event, so participants should come with ideas for future titles and a great book club name. Register by Wednesday, December 8th with Miss Lisa at 423-7280 or jamlibkids@gmail.com.